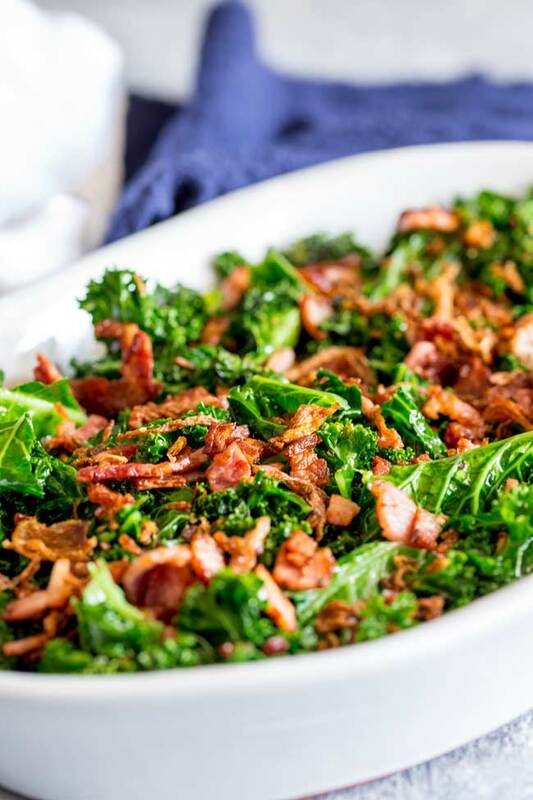 This Kale and Bacon side dish is the perfect recipe for the holidays. With all the carbs and heavy sides on the table, you want an easy healthy option. That is where this quick sautéed kale with bacon comes in. Cooked on the stove with olive oil, it is super healthy and delicious, plus the crispy bacon adds flavor and stops it feeling too healthy. I mean this is the holidays! Kale? Really? Where’s the comfort food? I know, I am not really one for posting diet food or jumping on the latest health food train. Kale is actually delicious (when cooked well) and I can get down with delicious and healthy…..as long as there is a helping of whipped sweet potato to go along side! p.s kale is super duper packed with all sorts of vitamins and minerals….I am not a dietitian or a nutritionist so I won’t list them all, but anything that can give you almost 700% vitamin K must be good for you right? Kale has a wonderful deep flavor, but I find the tough woody stems to be quite strong and also they take more cooking. By the time they are cooked the leaves have gone soggy. So we want to remove the stems and just cook the leaves. Save the stems for your rabbit (or the compost heap). To do this wash the leaves well then take a leaf and fold it down the stem line. Then take a sharp knife and cut away the woody stem. After that you can cut the leaves into nice big chunks. 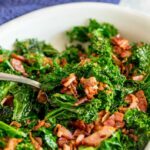 How to make Sautéed Kale with Bacon. This is one of the easiest recipes I have. You cook the bacon in hot olive oil until it is crispy and has rendered it’s fat. Then you remove the bacon and add in the chopped kale. It gets cooked in the bacon grease and a splash of water until softened and bright green. 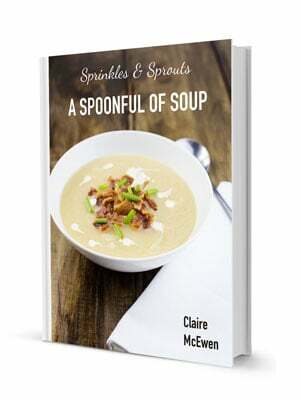 Season it generously and serve topped with the bacon and a spoonful of crispy onions. So quick, so delicious and so easy! Just like spinach, kale wilts down when it cooks so you will need more than you expect. For 6 people you’ll want 8 cups of chopped kale. If you are serving this as part of a thanksgiving or Christmas meal then that amount will easily serve 8 people. 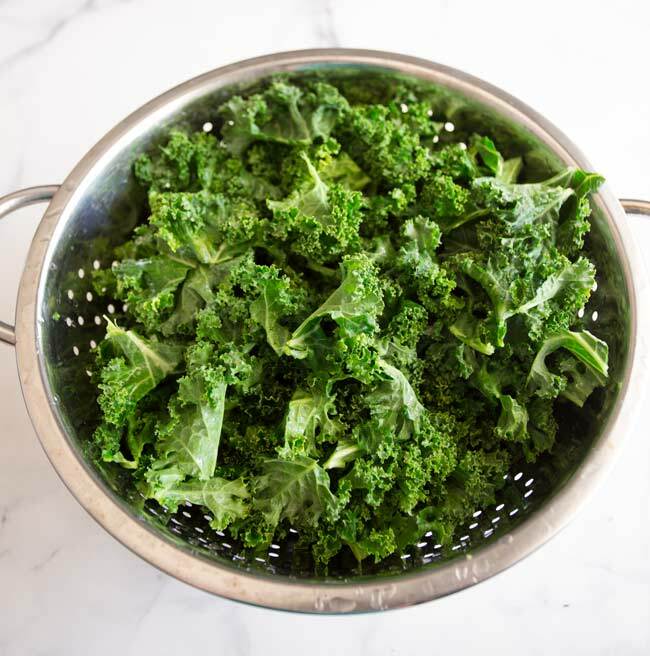 If you wash and trim kale, you can then blanch it in boiling water for 3 minutes, then use a slotted spoon to remove it and plunge it into ice water. Once drained you can portion it up into freezer bags and freeze it in the deep freeze. It defrosts perfectly and cooks up as though it were fresh. But I have already made the recipe can I freeze that? Of course, although the bacon and crispy onions go a little soft. But it is still delicious. If you have some boiled potatoes or roast potatoes left over then try frying off a little onion, adding chopped cooked potatoes and cooking until crispy, then add in the kale and fry for a couple of minutes. Some extra salt and pepper and you have a delicious new side dish. Or add a fried egg and you have dinner! Or Brunch! Every year I want to try doing that with my cheesy layered potatoes but there is never any left! 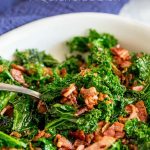 Why not pin this quick side dish recipe for Sautéed Kale and Bacon. Pin it here. 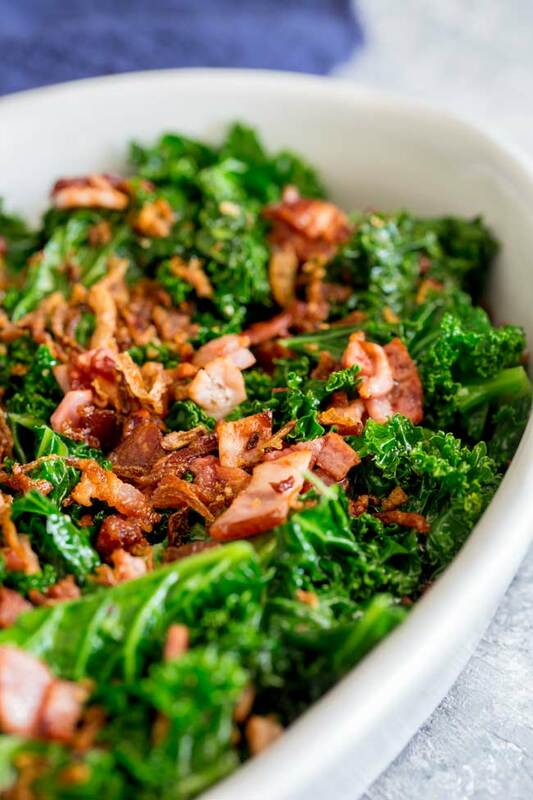 This Kale and Bacon side dish is the perfect recipe for the holidays. With all the carbs and heavy sides on the table, you want an easy healthy option. That is where this quick sautéed kale with bacon comes in. Cooked on the stove with olive oil, it is super healthy and delicious, plus the crispy bacon stops adds flavor and stops it feeling too healthy. I mean this is the holidays! Cut the bacon bacon into 1 inch pieces. Add the oil to a large skillet and fry the bacon until cooked and crispy. Use a slotted spoon to remove the bacon from the pan, leaving behind the bacon grease. Turn the heat to high and add in the kale and stir constantly in the oil so every thing is coated. Add the quarter cup of boiled water and let the kale lightly wilt. Once the water has evaporated, season the kale generously. 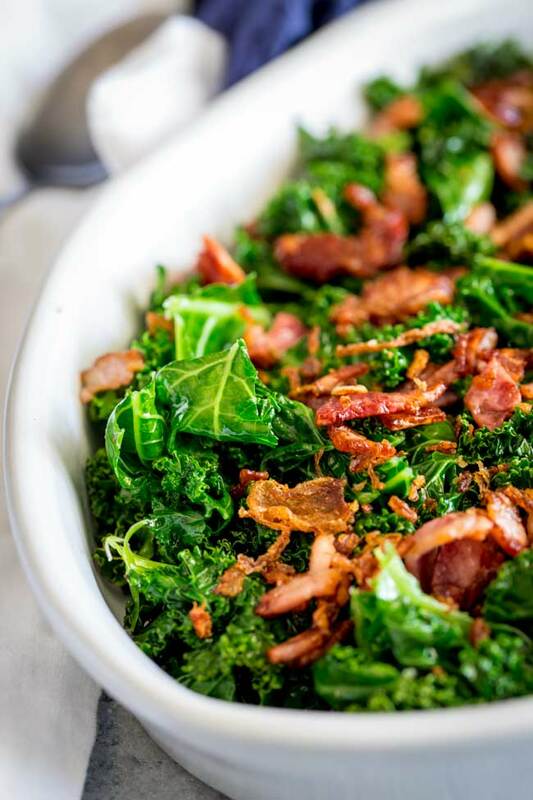 Add the kale to a serving dish and sprinkle with the cooked bacon and crispy onions. 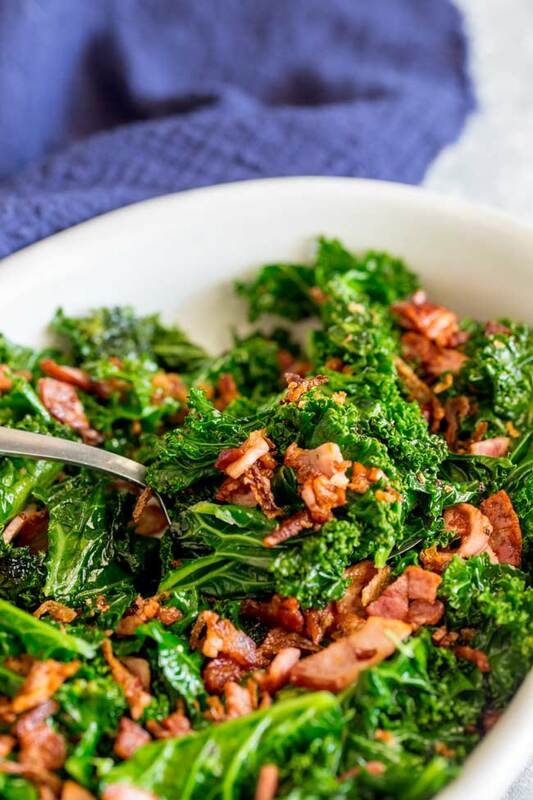 If you love food why not subscribe to my newsletter, I will drop you an email every now and then, just to say hi and send you a couple of recipes I think you might love, like this Sautéed Kale and Bacon. Another great dish for the holidays! Everything tastes better with bacon! !